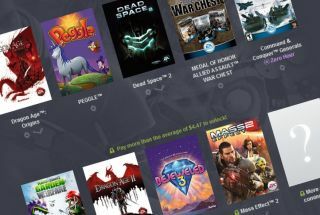 The latest Humble Bundle returns to the warm embrace of Origin, with a selection of nine EA games packaged up in a couple of different price tiers in support of some very worthwhile charities. For as little as a single, solitary dollar, you can pick up Dragon Age: Origins, Peggle, Dead Space 2, the Medal of Honor: Allied Assault War Chest, and Command & Conquer Generals with the Zero Hour expansion. For beating the average purchase price, you'll also take home Plants vs. Zombies: Garden Warfare, Dragon Age 2, Bejeweled 3, Mass Effect 2, and more games to be named later. All the games in the bundle are redeemable on Origin. It's a nice compliment to the 2013 Humble Origin Bundle, which included Dead Space 1 and 3, and the original Mass Effect, and EA is once again doing a solid for charity by taking no cut of the sales. Instead, all money earned will be divided up between the usual 'Humble tip' and three good causes: Girls Who Code, The V Foundation for Cancer Research, and BuildOn. The Humble Origin Bundle 2 is live now and runs for two weeks, which means the curtain drops on April 28. Update: Four more games have been added to the bundle: SimCity 2000, Wing Commander 3: Heart of the Tiger, Wing Commander 4: The Price of Freedom, and Ultima VII: The Complete Edition. Access to the new games will be given to anyone who beat the average price when they bought the bundle. The Humble Origin Bundle 2 will remain available until April 28.